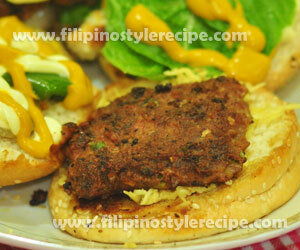 Filipino Style Recipe: Fish burger patty is consist of fish flakes mixed together with eggs, minced onions, breadcrumbs, Worcestershire sauce, parsley, salt and pepper. Flattened the mixture into a disc-like shape then fried or grilled until tender. 1. In a pan, arrange fish then cover with water. Bring to boil and simmer until fish is tender. Drain and pat dry. 2. In a large bowl, place fish then mash with a fork into flakes. 1. In a bowl, combine all the ingredients then mix thoroughly. 2. Divide the mixture into serving pieces. Roll the mixture into balls and flatten into 1/2 inch on an even surface. 3. In a tray with grease-proof paper, arrange patties then cover with plastic. Place in the fridge for at least 30 minutes. 1. Fry or grill patties for 3-4 minutes each side or until color turn to brown. 2. Serve with mushroom gravy or with buns together with sliced tomato, lettuce, cucumber and onion rings. 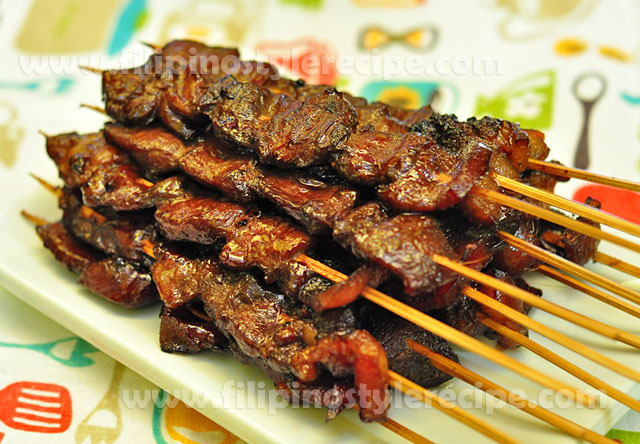 Filipino Style Recipe: Beef kebabs(kebobs) is a popular middle eastern dish that is made up of meat and/or vegetables grilled on a skewers or spit. The traditional meat for kebab is made of lamb meat, but some used beef, goat, chicken, pork and fish. This dish was adopted in Central and South-east Asian regions specially in the Philippines. 1. In a bowl, combine beef and marinade then cover and marinate for overnight inside the fridge. 2. Soak bamboo skewers in water for 15 minutes. Set aside. 1. Drain beef from marinade. Combine ketchup and oil in marinade then mix well for basting. 2. 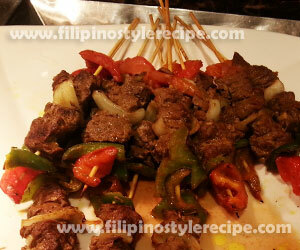 Arrange beef and vegetables as desired on skewers then brush with marinade mixture. 3. Repeat the steps from remaining pieces. 1. Grill kebabs over hot charcoal for 10-15 minutes or until tender while basting with marinade mixture. 2. Transfer serving plate and serve.